The stitches are out from my finder after hand surgery. The surgeon had to remove scar tissue and repair the tendon. So far, my hand looks pretty good. Oddly, i have two fingers that are swollen and cannot bend instead of just the one. I will be trying to stretch them out and exercise them while traveling through Ireland over the next couple of weeks. Make a gentle fist, wrapping your thumb across your fingers. Stretch only until you feel tightness. You shouldn’t feel pain.Hold for 30 to 60 seconds. Release and spread your fingers wide. Repeat with both hands at least four times. This stretch helps improve the range of motion in your fingers. Hold your hand out in front of you, palm facing you. Hold for 30 to 60 seconds and release. Repeat at least four times on each hand. 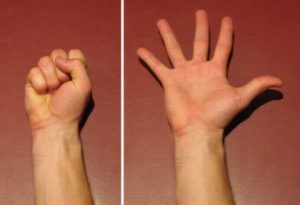 Finger bends strengthen your flexor tendons and increase the mobility of tendons across your fingers. 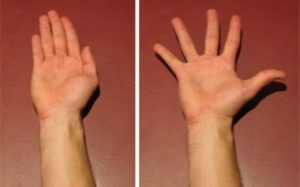 To perform this exercise, place your hands palm side up on a bench. Keeping your fingers straight, gently bend your fingers at the knuckles as far as possible. Hold this position for a few seconds. Bend your wrist and fingers backwards as far as you can. Hold this position for a few seconds and return your hands to the starting position. . Perform 50 repetitions of the exercise each hour you are awake, Perform this exercise on both hands. Using a rubber band can strengthen the tendons in the hands post surgery. 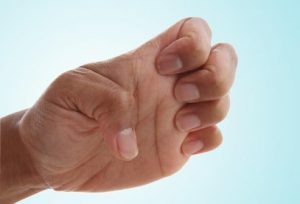 To perform this exercise, place an elastic band around your thumb and fingers. Keeping your elbow straight, Stretch the elastic band by opening your fingers and thumbs. Hold this position for three seconds. Slowly return your fingers and thumb to the starting position. Perform this exercise until fatigued. Begin with your fingers together a s demonstrated. 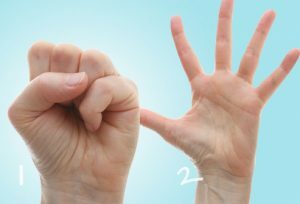 Spread your fingers apart as far as you can go without pain and provided you feel no more than a mild to moderate stretch, then return to the starting position.